Do you have an overactive thyroid? Millions of people have an overactive thyroid gland. Many don't know it. This condition, known as hyperthyroidism, occurs more often in women than in men. Since the thyroid gland controls the body's metabolism, an overactive thyroid puts the body into overdrive. Heat intolerance. A sped-up metabolism leads to an increase in body temperature. Exhaustion. A body perpetually in overdrive tires out more quickly. Emotional changes. Fatigue coupled with an overstimulated central nervous system can lead to a variety of emotional changes. Anxiety intermixed with depression, as well insomnia or irritability, are not uncommon. Perspiration and thirst. As your body temperature rises, your sweat glands tend to overwork, and you feel the need to continually replenish fluids. Constant hunger. As your body uses up energy, it tends to cry out for more. Some people have an insatiable appetite. Unexplained weight loss. Even though you may eat constantly, you could lose weight, usually between 5 and 10 pounds—even more in extreme cases. Racing heart. You may notice your heart racing out of the blue. This can occur when you are exerting yourself or when you are relaxing. You may find your pulse is much faster than normal. Enlarged thyroid gland. Sometimes, but not always, the thyroid gland becomes enlarged and may protrude from the neck to form a goiter. If the goiter is large enough, it may feel lumpy. Hand tremors. Overstimulated nerves can make your hands shake. The shaking may be subtle, or it could be to the point where you can't steadily carry a drink without spilling it. Diarrhea. An overactive thyroid causes the digestive system to speed up, and this leads to frequent, loose bowel movements. Eye problems. In some people with an overactive thyroid gland, eye problems can occur and be quite severe. The most common eye symptom is a retraction of the eyelids that makes the eyes appear to bulge or stare dramatically. Your eyes may also be puffy and watery, and you may experience double vision. Hives. You might notice an itchy rash, which can be relieved with antihistamines. Menstrual changes and infertility. Women may notice lighter or missed periods, and may have trouble becoming pregnant. If you notice these symptoms, call your doctor and ask about having your thyroid tested. Left untreated, an overactive thyroid can cause other health problems, such as an increased risk for osteoporosis and potential heart trouble. To gain a greater understanding of hyperthyroidism and hypothyroidism, as well as how your thyroid works, buy Thyroid Disease, a Special Health Report from Harvard Medical School. Could you have a thyroid problem-and not know it? Is it just midlife, or is your thyroid slowing down? 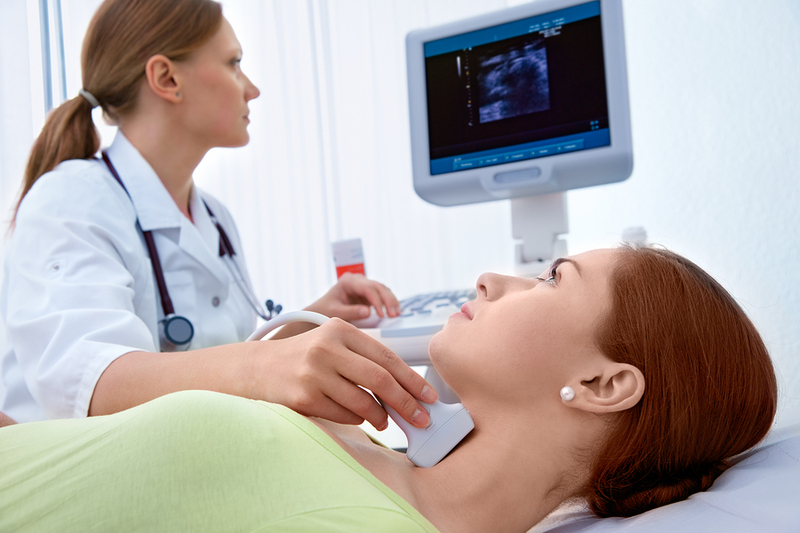 Do you need a thyroid test?